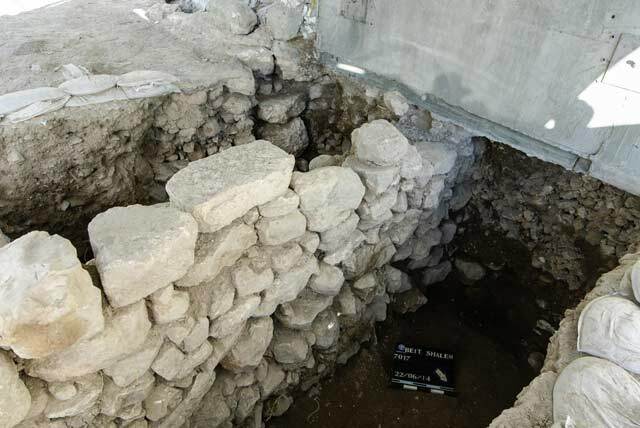 In 2013–2014, the salvage excavation continued in the spring house and on the eastern slope of the City of David (Permit Nos. A-6690, A-7017; map ref. 222451–534/631151–214; Shukron, Uziel and Szanton 2013). The excavation, undertaken on behalf of the Israel Antiquities Authority and financed by the El‘ad Foundation, was directed by J. Uziel and N. Szanton, with the assistance of M. Hagbi (area supervision), N. Mizrahi and N. Sanduka (administration), V. Essman and Y. Shmidov (surveying and drafting), A. Peretz (field photography) and C. Amit (studio photography). The excavation areas were located within the City of David National Park, near the Gihon Spring, and were excavated as part of the development of a tourism site between Warren’s Shaft and Hezekiah’s Tunnel. The excavation in the visitor’s center of the Spring House was completed in early 2013; in the second half of 2013 and in 2014, an area was excavated further up the slope, as far as Wall NA (Wall 1), unearthed by K. Kenyon (Steiner 2001:89). Most of the finds from the excavation in the visitor’s center date from the Middle Bronze Age, the Iron Age II and the Early Roman period. Layers of debris from the Early Roman period and architectural remains from the Mamluk period were exposed at the top of the slope, east to the entrance to Warren’s Shaft. A sequence of 11 strata ranging from the Middle Bronze Age to the modern era was revealed. This stratigraphic sequence does not exist in its entirety in any of the other excavation areas in the City of David; nevertheless, some of the strata extend throughout the site and make it possible to position the remaining strata in relation to them to create the full sequence. The excavation during these two years allowed us to form a clear stratigraphic picture and reconstruct the activity undertaken in different periods on the eastern slope of the City of David. Spring House Visitor Center. A system of Middle Bronze Age fortifications (Stratum 10; Shukron and Reich 2009) constructed around the Gihon Spring was exposed in previous excavations. The system included a massive tower (height c. 7 m) built around the spring, and a protected corridor (the fortified passage) that led from the city to sources of water. During this season, the excavation continued deep into the tower, and the layers above and next to the fortified passage were excavated, exposing the tops of the passage walls. It became apparent that the fortification system was covered with a thick layer of fill from the seventh century BCE (Stratum 7). 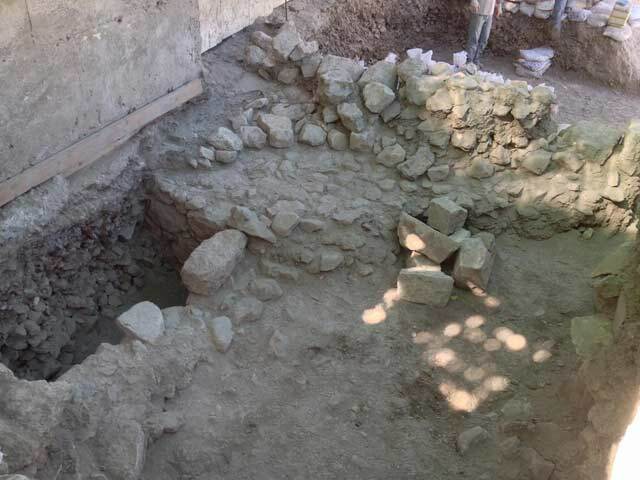 The continuation of two buildings (Building 2482 of Stratum 9 and Building 2473 of Stratum 8) dating to the Iron II (ninth–eighth centuries BCE) was also exposed during this season. Building 2482 of Stratum 9 was constructed adjacent to the northern wall of the fortified passage (Fig. 1). Its preserved walls (max. height. 2 m) stagger from west to east, and were treated with white plaster. The floors were made of plaster that curved up onto the walls. An earthen floor that probably belonged to a later phase in the building was exposed above the plaster floor. The opening leading into the building was discovered on its eastern side in a previous excavation (Shukron and Reich 2009). The entrance threshold (0.8 × 1.2 m) was built of dry fieldstone construction. The eastern wall of the building was constructed of two rows of stones (width 0.9 m), while the southern wall was built of a single row of stones (width 0.4 m). It seems that the southern wall was narrower because of its location along the fortified passage, which supported it. Ostensibly, its construction was unnecessary because it ran along the solid wall of the fortified passage; however, it seems that the wall was erected in order to facilitate the construction of a second floor or to support the building’s ceiling. The western part of Building 2482 has not yet been excavated, but a connection apparently existed between this part of the building and the opening of the northern cave above Warren’s Shaft. Buildings ascribed to the Iron Age II, constructed similarly to Building 2482, have been exposed in other areas in the City of David, as at the eastern end of Section A on the bedrock terrace near City Wall NB (W3 in the final report; Steiner 2001:10–12), in Area G (Shiloh 1984:17–20) and south of the rock-hewn pool near the Gihon Spring (Shukron and Reich 2009:59). Judging by the pottery found in the different phases of het building, it should be dated to the late ninth century and early eighth century BCE (Uziel and Szanton, in press); this date is similar to that of the ceramic finds form the hewn pool (Reich, Shukron and Lernau 2007; De Groot and Fadidah 2011). Building 2473 of Stratum 8 was also constructed adjacent the fortified passage; its southern wall clearly adjoined the fortified passage. The ceramic finds from Stratum 8 suggest that the building dates from the end of the eighth century and early in the seventh century CE. Evidently, buildings of similar construction were erected during the Iron Age II south and north of the fortified passage and the Middle Bronze Age rock-hewn pool. The masons who built these structures were familiar with the older buildings and utilized them for their needs. Since Buildings 2482 and 2473 were constructed besides the massive northern wall of the fortified passage, it seems that this wall stood to a great height until the end of the Iron Age II (Uziel, Shukron and Szanton 2013; Uziel and Szanton, in press). Based on the fill covering the fortification system and the buildings of Strata 8 and 9, it appears that the fortification system continued to serve the residents of the city until the end of the Iron Age. At the end of the Iron Age, this part of the city was destroyed and abandoned, and it was later covered with the ruins that had tumbled down the slope (Stratum 7). The ruins in Stratum 7 covered both the remains in Strata 8 and 9 and the massive fortifications of the spring. 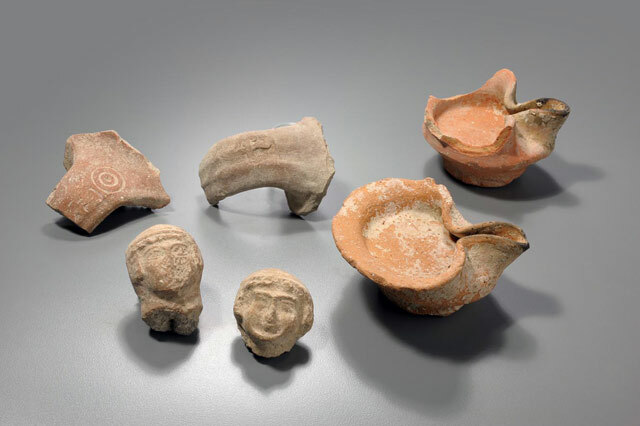 The finds from Stratum 7 included numerous fragments of pottery vessels, among them lamps and figurines (Fig. 2), as well as a clay-bowl fragment bearing an ancient Hebrew incised inscription consisting the name “Yahu Ben Banah” (Fig. 3; Uziel, Eshel and Szanton, in press). The settlement in the area of the spring was not renewed until the Early Roman period (Stratum 5), when retaining walls built along Nahal Qidron were apparently used to direct the water along the streambed and retain collapses and soil fills. Installations were discovered within these collapsed fills, such as an Early Roman-period lime pit that was built above the collapsed material from of the spring tower (Uziel, Shukron and Szanton 2013; Shukron, Uziel and Szanton 2013). Top of the Slope. A layer (thickness 0.4 m; Stratum 4) of debris dating to the Early Roman period was discovered. A similar but much thicker (max. thickness 7 m) layer of debris was unearthed in Area D, c. 200 m south of the excavation (Gadot 2014: Fig. 7a). Building remains from the Mamluk period (Stratum 2)—two agricultural terrace retaining walls, a built installation and part of a building (13043)—were exposed above the Early Roman-period layer of debris. Most of the Stratum 2 remains were discovered in the western part of the area, near the visitor’s entrance to Warren’s Shaft, indicating that activity took place in this area during the Mamluk period. One of the retaining walls (13037) was aligned in a north–south direction and was haphazardly built of a single row of small and medium-sized fieldstones (width 0.3 m); it was preserved to a height of five courses (height 1.3 m). The wall, which was built on top of the the Early Roman-period debris layer, severed the layer in several places. The second retaining wall (13039) was exposed in the southwestern part of the excavation. It was constructed of two rows of medium-sized fieldstones (width 0.5 m; Fig. 4) along an east–west axis; so far, six courses of the wall have been exposed. This wall cut through part of the debris layer as well. A circular installation (diam. 1.2 m; Fig. 5) was exposed near the southern face of the wall. It comprised a level surface of small fieldstones surrounded by a circular wall built of one row of fieldstones; only the northwestern part of the installation was preserved. Part of a room in a building (13043; 0.8 × 2.2 m) was uncovered slightly to the south of the installation. This building was damaged when the entrance to the visitor’s center to Warren’s Shaft was built on top of it; its plan is therefore unclear. The foundations of three of the room’s walls were unearthed. Its floor was not exposed, as its elevation was probably higher than that of the wall foundations and was thus destroyed during the construction there while the foundations were preserved. The floor of the building was evidently at the same level as the floor of the circular installation. Inside the room was a yellowish brown fill mixed with numerous fieldstones, perhaps a deliberate fill that served as of the room’s foundations. Apparently, the installation was part of the building, and Retaining Wall 13039 delimited the structure from the north. 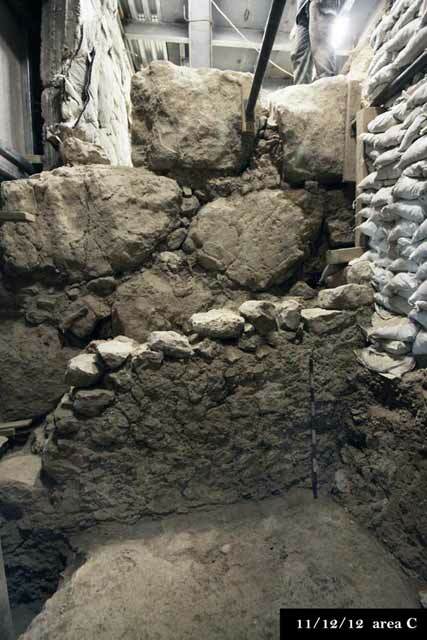 Eleven strata were exposed in the excavations on the eastern slope of the City of David. In the early periods—the Middle Bronze and Iron Ages—the spring was fortified so as to protect the city’s main source of water and the construction of the water systems alongside it. In the Iron Age II, the city expanded, and buildings were constructed wherever possible, even on the lower parts of the slope. It seems that the slope was used for farming and agricultural terraces during the Early Roman period, when installations were built; at the end of this period, the area was used as a refuse site. During the Mamluk period, the settlement was renewed at the top of the slope, and the building above the Gihon Spring was in used. De Groot A. and Fadida A. 2011. The Pottery Assemblage from the Rock-Cut Pool near the Gihon Spring. Tel Aviv 38:158–166. Reich R., Shukron E. and Lernau O. 2007. Recent Discoveries in the City of David, Jerusalem. IEJ 57:153–169. Shiloh Y. 1984. Excavations at the City of David I: 1978‒1982; Interim Report of the First Five Seasons (Qedem 19). Jerusalem. Shukron E. and Reich R. 2009. Excavations in 2008 near the Spring in the City of David (Area C, South). City of David Studies of Ancient Jerusalem 4:55–64 (Hebrew). Shukron E., Uziel J. and Szanton N. 2013. Jerusalem, City of David. HA-ESI 125. Uziel J., Eshel E. and Szanton N. In press. A Late Iron Age Inscribed Sherd from the City of David. IEJ. Uziel J. and Szanton N. In press. Recent Excavations near the Gihon Spring and their Reflection on the Character of Iron Age II Jerusalem. Tel Aviv. Uziel J., Shukron E. and Szanton N. 2013. The Continued Use of Jerusalem’s Canaanite Fortification during the Period of Judean Monarchy. City of David Studies of Ancient Jerusalem 8:17–30 (Hebrew). 1. The wall of Building 2482 constructed next to the wall of the fortified passage, looking south. 2. Finds from Stratum 7 (seventh century BCE). 3. 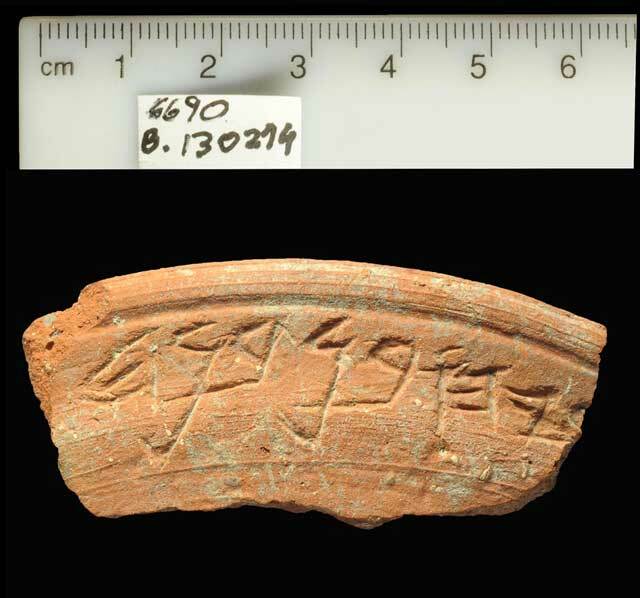 Fragment of a ceramic bowl bearing an ancient Hebrew inscription. 4. Wall 13039, looking southwest. 5. Wall 13039 and a circular installation and Building 13043 south of the wall, looking northwest.